Reflections Around the Campfire: Wrapping a Gift for a Fellow Traveler? Here's a Tip! Wrapping a Gift for a Fellow Traveler? Here's a Tip! In a previous post about the Butler County Donut Trail (link HERE), I had mentioned that I enjoyed perusing Visitors’ Guides from various states. You know the ones I’m talking about, don’t you - the glossy booklets you can find at rest areas along the interstates or request from state, county and city tourism departments? Those guides are some of my favorite reading material! Nothing better to spark a case of wanderlust than gorgeous photos of travelers having the time of their life in the most beautiful or fascinating settings, right? I’ve found that when I request a Visitor’s Guide from many states, a state road or highway map is included in the packet. Since, in addition to our GPS unit, we travel with an edition of the Rand McNally Road Atlas that contains a listing of Walmart and Sam’s Club locations, those state maps are usually relegated to our filing cabinet full of travel info. Every once in a while, during a moment of spontaneous ambition (no, sadly, those moments don’t occur very often), I’ll clear out the old guides and maps from our files. The guides end up being recycled, but the maps . . . Do you realize that highway maps make the best gift wrap for travelers?! Earlier today I was wrapping a “house warming” gift for our friends Patty and Rick who recently purchased a travel trailer. I didn’t have a map of their beloved North Carolina so I used Virginia instead. (It was the best I could do and only one state away!) It’s fun pairing the “wrapping paper” to the individual gift recipient’s interests or favorite places and it’s a creative way to make use of something that would otherwise be tossed. Plus, the paper can still be recycled after the gift has been opened! Maybe I should call this gift mapping . . . 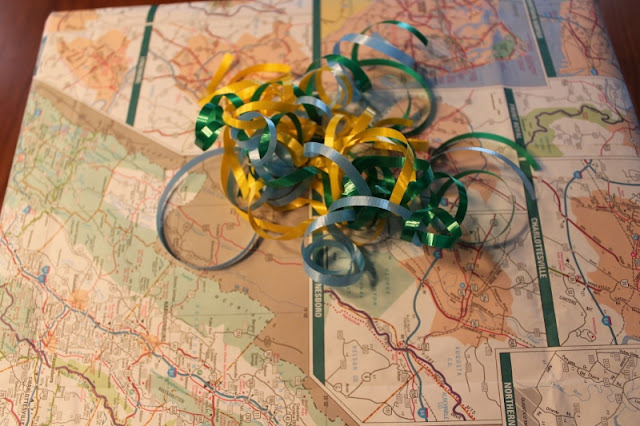 So, if you have any old highway maps in your archives, why not pull them out, use them up and put a smile on someone’s face the next time you offer a gift?